Mohamed ElBaradei, one of the key leaders of Egypt’s protest movement, has brought his country’s peace treaty with Israel into doubt in an interview with Der Spiegel. ElBaradei: No. Something the Israelis also need to grasp is that it’s impossible to make peace with a single man. At the moment, they have a peace treaty with Mubarak, but not one with the Egyptian people. The Israelis should understand that it is in their long-term interest to have a democratic Egypt as a neighbour, and that it is prudent to acknowledge the legitimate interests of the Palestinians and to grant them their own state. 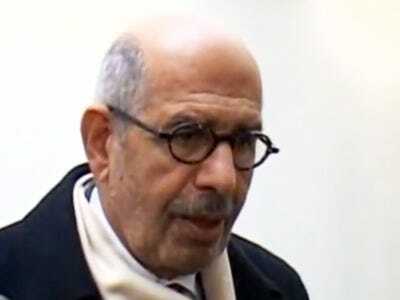 What ElBaradei is saying isn’t exactly surprising. He’s suggesting a more democratic government in Egypt would reflect Egyptian opinion and public sentiment, which is that Israel should do more to remove itself from Palestine and allow it to become an independent state. While it may not be surprising, it may be unsettling to many hoping that the relationship between Israel and Egypt would remain “stable” in the wake of a new Egyptian government. Instead, it seems as if the relationship will change with Egypt pushing for changes in the region’s status quo, if a new democratic government does form.